Psypoke - View topic - THE ADVENTUREs OF MUDKIP!!! Read it NOW!!!!! THE ADVENTUREs OF MUDKIP!!! Read it NOW!!!!! That reminds me of something that happened on my friends colluseum - the confused metagross attacked its trainer. AWESOME!! !The best story i have ever read!!! can someone please choose the winged egg or the green jem?? You touch the winged egg looking at it's shininess and it's delicate features. Suddenly the ground starts rumbling. Dust is shook up, and you are quickly blinded by the stinging sands. When the dust clears up, you find yourself back at the top of the moon, out of the crater. Suddenly, something orange quickly flits by. It flits again, this time striking. This goes on for a while, until you quickly dig under the soft lunar soils underground. You see the orange thing flit into the hole BUT...!!! You see it's... a DEOXYS!!!!! Quickly you start wetting the soil, as you soften it and continue tunneling. After a quick bit of tunneling, you look back. The Deoxys has disappeared. A huge bright blast strikes the Deoxys hed-on, losing it's psychic grasp on you. A green dragon zooms out of the Pokémon world and reveals itself as RAYQUAZA!!!!! You are very frightened, seeing these two powerhouses fighting, and slowly back out. Suddenly you feel a gentle push behind you. It's A WHOLE GANG OF DEOXYS!!!! They fly over you and surround the Rayquaza. Then, they make their crystal center shine. They make a beam connecting to each other. It glows brighter and brighter, until it almost completely blinding. Suddenly, there is a sharp boom, and all the beams form into a blade-like blast shooting towards Rayquaza. You see that even the Rayquaza is too small to survive the full-force blast. You try saving by shooting an ice beam to try to stop the blast. But you shoot too early, making a mirror bouncing the gigantic blast into you!!! Rayquaza, discovering that you just saved him, quickly zoomed into you just when both of you were stricken. Sight went all white. Weightlessness was taking place. You felt numb all over, as it slowly... grew... DARK. 3 Mudkip is warped back to littleroot town, and rayquaza says him a farewell before returning back to the ozone. You may only vote once, but are allowed to change your vote! Wait did you just say November 25, 2007? This story is absolutely wacky, and when something is really funny I don't laugh (I just have this big smile on my face). On a scale of 1 to 10, 10 being the best I give it a 9.2. 3.: Mudkip returns to Littleroot Town (right next to a potential mob lol) and Rayquaza grants farewell and returns to the ozone layer (away from the hole lol). Last edited by DNA on Thu Mar 22, 2007 6:50 pm, edited 1 time in total. either i forgot or i'm not allowed to have that any. Location: Hint: that's not your house settling at night. You forgot bulbasaur on the pole! "What should we do with him?" "I dunno. He's been quite a riot..."
"All in favour of execution, please stand." You wake up to find yourself in a courtroom. Seeing all the people standing, they have agreed to your execution! You think about it, shiver... and create a plan. A fat priest approaches you and says, "May God forgive all your sins... *especially since you made so many......*"
You look around. There are many around you awaiting execution. You see a Torchic. He looks at you sadly and nods his head. The executioner approaches you. He gives you a nice, warm stare. You give him a cruel, cold glare. Parallel universes. He swings his glowing axe at you. Just before it stops you jump onto his axe and run up his axe, up his arm onto his shoulder, and give him a.... how could I explain this??? Blook spews out of his mouth as he drops his axe and gets shot out the window. Using superus mudkipus speed you grab his falling axe and whirl it at the cursed parchment. It whizzes into and through (yuck) the priests head and slices the parchment in half. Instantly, it stops smoking... and the room goes KA-BLOOOOIE!!!!!! All the executionees rose back and ran away. After opening your eyes when the smoke clears, all you see is the table you are on and a crater. Like the hero in those western movies... you walk away into the sunset. Oh yeah, just as crazy and maniacal as the last 18 parts of the story. Dang I love this epic! 5/5!! It is nearly perfect and it's the best story of pokemon I have ever read! I give it a 10/10 because it is the best pokemon story I have ever read. Ooooohhhh... i haven't continued the story yet......... it's been a while. I'll leave that as a cliffhanger for until I can finish. A Trapinch almost bit off your leg if not for your superus mudkipus skills. You quickly and agilely use water gun. The trapinch drinks it and dies. After more walking, you wind up in a huge mountain. A rainbow hovers over the peak. Walking around, you decide to explore the misty mountain. There is much water and seaweed to ingest. After a quick feast, you decide to nap. Suddenly, you start sweating. You wake up to find the sun blaring at you, and dust is flying all over. You scramble into another room for shelter. In the other room, you find the culprit: 6 Sun Castform gathered in a circle. They are slowly spinning and as they spin, the little orbs on their head grow brighter as the sun does. They're making it too hot, you think, and approach the mystic circle. As soon as you take a step, you realize it was a fatal mistake, as all the Castform suddenly turn around to you, their orbs glowing, and zapping you with dozens of solar beams. You realize that all along they were charging Solar Beams!!!! As you get weaker from the super effective hits, you decide to take action. You focus your energy super tensely. You are still getting zapped but you don't lose concetration. You suddenly start shaking and turn red. You are enduring the pain, but you do not feel anything. The ground around you starts steaming up and melting. The solarbeams keep shooting but suddenly dissapear into a green hole. This continues until finally, you can't take is anymore, and release the energy. 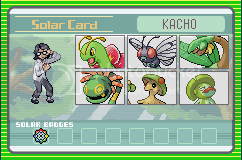 Instantly the green holes exploded, causing massive shockwaves and K.O.ing the Castforms. However, you still have the super-focused energy tearing at you inside, and expel that too. You appear to look like you're flaming as the red energy blasts out of you and destroys the whole mountain you were in. You boldly flee as the mountain collapses to rubble. A sign bonks on your head as you head out. It says Mt. Faraway, Home to the Ho-oh! You realize that you're in big trouble, and are quickly on your way. Last edited by elite42 on Fri Apr 20, 2007 8:33 am, edited 1 time in total. Heheheh...Castforms get pwned by the Mudkip, who might get pwned by Ho-Oh. ROFL over here! hmmm... i wonder.... [strike]when[/strike] if this fic finishes, should I make an adventures of treecko or something like that?